This is a serial web fiction set in Earth's not too distant future: 2193. The known galaxy has been ripped apart by war. Now, the people of "Proper Society" suffer under the tyrannical rule of the Civil Triumvirate. However, a band of revolutionaries fight against this evil power. They call themselves the Freedom Coalition. 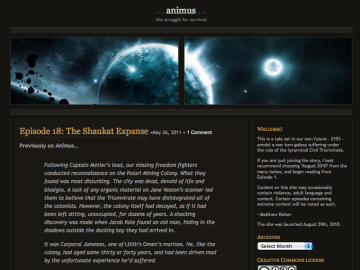 Animus features monthly episode updates, along with special features via our wiki, twitter feed, and facebook page. Join the adventure! Animus has not been reviewed yet. Animus has not been recommended yet.